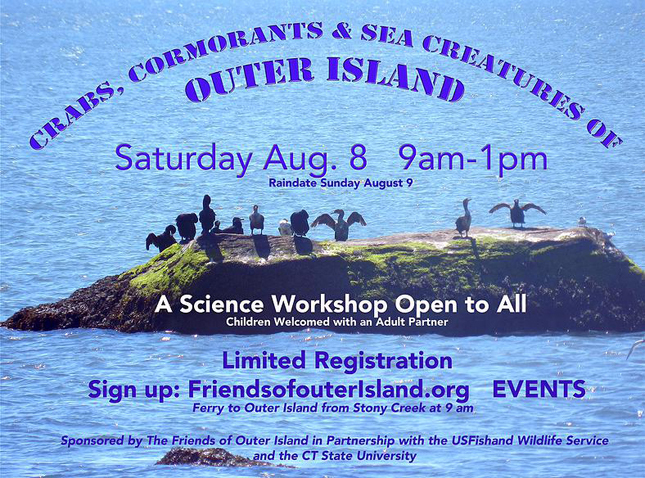 The public is invited to a natural science workshop on Outer Island, a Unit of the Stewart B. McKinney National Wildlife Refuge on Saturday August 8 with a rain date of August from 9 AM to 1 pm. Participants will count invasive crabs, observe cormorants and shore birds, and seine for sea creatures that are part of the food chain of Long Island Sound. Children are welcome accompanied by an adult. CLICK HERE for more information.